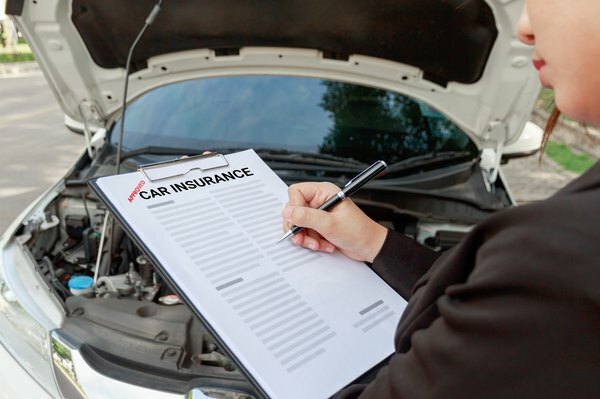 Can I Deduct My Car Insurance on My Business Taxes? 1. Can I Deduct Depreciation on My Primary House? 2. Can Cable for a Business Rental House Be Deducted From My Taxes? 3. Can I Write Off Money I Give to My Child's Business? If you have your own business and you're using a car for business purposes, you are usually entitled to a vehicle tax deduction. Generally, you can either claim the mileage you drive for business at an Internal Revenue Service published rate or claim actual expenses including car insurance as a business expense. Under the Tax Cuts and Jobs Act, you generally can't claim vehicle expenses if you're an employee except under narrow circumstances. If you run your own business, you can usually claim either mileage at the IRS rate or your actual cost of operating the car. Often the simplest way to claim the business use of your car on your taxes is to take the business mileage deduction. The mileage rate is determined to include not just the cost of fuel but also other costs inherent in operating the vehicle, including insurance, maintenance and other related costs. For tax year 2019, the IRS mileage rate is 58 cents per mile, up from 54.5 cents in 2018. If you claim the standard mileage rate in a particular tax year, you must use it for the entire year, and you can't separately deduct any actual operating costs including insurance. There are certain restrictions on when you can claim the mileage rate. You must use it in the first year you own a car and use the vehicle for business, or you aren't able to claim the mileage rate in the future, although you can switch back and forth on a year-to-year basis after that. If you lease a car, you must use the mileage rate either the entire time you're leasing the car or not at all. You also can't use the standard mileage rate on your taxes if you're running a fleet of five or more cars for your business or if you've taken certain types of depreciation deductions relating to the vehicle in the past. While you can't deduct operating and maintenance costs when using your car for business if you take the mileage rate, you can deduct the cost of parking and tolls, such as if you park or take a toll road to visit a client. If you choose to deduct based on mileage, make sure to document the miles you drove and how they relate to your business. You may wish to keep a mileage log updated at the end of each trip in case you are ever audited by the IRS. Also include parking and toll expenses if you do incur them. If you don't want to take the standard mileage rate or aren't eligible to do so, you can claim the actual expenses involved in using your car for business. Remember that if you use the car for a mix of business and personal use, you can claim only those expenses relating to your actual business use, so you will still want to log mileage in order to apportion general costs, like insurance and maintenance, between business and personal use. For instance, if you pay $2,000 per year for car insurance, and use your car for your business 75 percent of the time based on mileage, $1,500 of your insurance costs would normally be deductible. Log all the expenses involved in taking care of your vehicle, from gassing up the tank to having the tires rotated, and save receipts and bills from your insurance company and other businesses. If you're self-employed or have a pass-through business where you report your expenses directly on your personal tax return, you'll include vehicle expenses on Schedule C of Form 1040. If your business has its own tax return, you'd include the business use of the car on your business tax return. You can also often deduct the cost of the vehicle itself, or at least a portion of the car's cost if you only use it some of the time for business. Since the car is a capital asset that lasts multiple years, you can either claim this over time using IRS depreciation schedules or, often, in the year you acquire it using a Section 179 deduction, which is a special provision in the tax code letting you deduct business equipment valued under $1 million in a single year. See which method would be most advantageous to your business. Do the same for determining whether to claim mileage or actual expenses if you're eligible to do either. You may want to keep all records so you can calculate your mileage and actual expenses and see which deduction is larger. There are certain expenses you can't deduct as business costs. If you get a ticket for a traffic violation, you can't deduct your fine, for example. You also can't deduct what are considered ordinary commuting miles or costs. For instance, if you own your own business and regularly drive to your office or shop, you can't deduct that cost. You also can't deduct costs related to parking at your regular place of business. Even if you're bringing tools or equipment from home, you still can't deduct commute costs. You can deduct when you travel to a client site or when you go to a temporary place of business, even if you're starting from home. If you're going between multiple job sites, you can claim the cost of travel between them, but you need to exclude any personal side trips you make along the way if they boost your mileage. If you have a home office and leave it to go to a client site, you can claim the expense. Ordinarily under the current tax law, employees can't deduct vehicle expenses, though they may be able to get reimbursed by their employers for them. Certain exceptions do apply. Armed forces reserve members traveling more than 100 miles from home as part of their duties can deduct related expenses, including mileage, parking and tolls. Some government employees paid on a fee-for-service basis can also deduct their business expenses, including either mileage or vehicle costs such as car insurance. Some performing artists with multiple employers are also eligible to deduct their business expenses, including those related to driving. If you use a car for charitable purposes, such as while volunteering, you are often eligible to deduct either your actual expenses, such as gas and oil, or your mileage at a rate of 14 cents per mile. You can't deduct general costs, such as insurance, general maintenance, registration fees or new tires. Whether you claim miles or expenses, you can deduct the cost of parking and tolls. You must be doing the work for an IRS-recognized charity. The vehicle cost is deductible as a charitable donation, and you must itemize your deductions to claim it and other charitable donations on your taxes. See if you will save more by itemizing or by taking the standard deduction. Keep a record of when and why you used your car for charity, including the miles driven and any expenses incurred. See whether it's worth itemizing your deductions and, if so, whether you can get more of a deduction using miles or actual expenses. Remember that you can't deduct for your time or labor in volunteer work for a charity. Where Can I Write off My Startup Investment Costs? "If I'm Renting, Can I Still Write Off My Mortgage Interest on My First Home That's a Rental?" Can I Claim Property Taxes on My Personal & Business Deductions? Is It Tax Deductible If My Son Lost His Health Insurance & I Paid for His Surgery? Can I Claim My Parents on My Tax Return If I Insure Them? Can I Deduct Mortgage Interest on a Home That Is Owned by My Wife? Do I Have to Pay Income Tax on My Hospital Bills?